Victoria Walls, a Tennessee native, is an alumna of Saint Louis University and The University of Missouri at St. Louis. During her MFA, she held multiple artistic leadership positions such as poet laureate and president of the Graduate Writers Association. She is now a professor of English as a Second Language at Saint Louis University and an assistant editor for Boulevard Magazine and WomenArts Quarterly. Her poems are featured in Slippery Elm and december magazine. She can also be found in “Voices at the Corner,” a blog for The Center for Social Empowerment where she served as Poet in Residence. 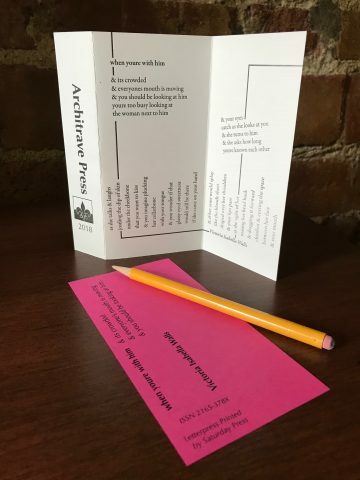 Poem letterpress printed by hand on 100lb archival card stock measuring 7″ x 6″ with 2 folds & packaged in an individual sleeve. Numbered edition of 50 copies.